Franklin Resources Inc. (BEN) is a publicly owned asset management holding company. The firm provides its services to individuals, institutions, pension plans, trusts, and partnerships. This dividend champion has paid dividends since 1981 and managed to increase them for 37 years in a row. The most recent dividend increase was in December 2017, when the Board of Directors approved a 15% increase in the quarterly dividend to 23 cents/share. Over the past decade this dividend growth stock has delivered an annualized total return of 6.10% to its shareholders. Future returns will be dependent on growth in earnings and dividend yields obtained by shareholders. The company has managed to deliver a 3.70% average increase in earnings per share over the past decade. Franklin Resources is expected to earn $2.87 per share in 2019 and $2.96 per share in 2020. In comparison, the company earned $3.19/share in 2018 ( the amount includes a one-time adjusting item of $1.80/share related to the new tax law that was signed at the end of 2017). Between 2008 and 2018, the number of shares outstanding has decreased from 715 million to 538 million. 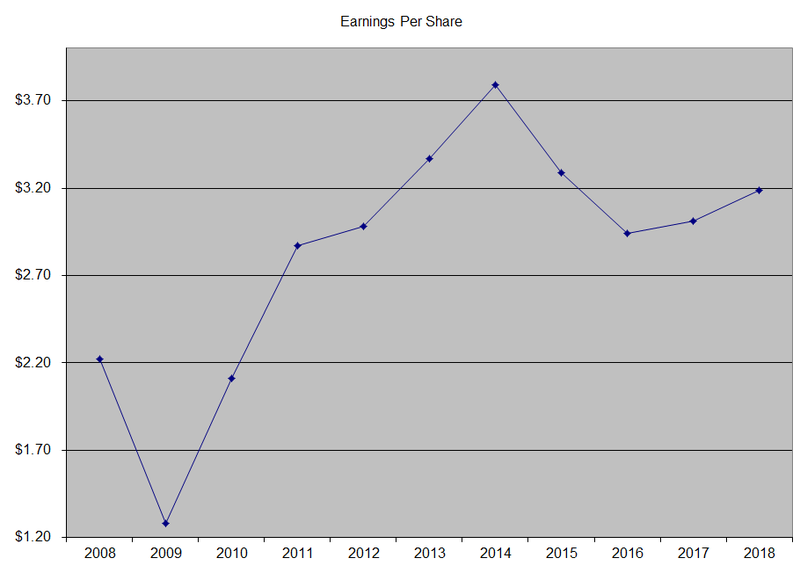 The consistent decrease in shares outstanding adds an extra growth kick to earnings per share over time. Overall I am bullish on asset managers, who have the odds stacked in their favor for future success. Essentially, the goal of the game is to get as much in assets under management, and then try to have low costs relative to competitors. As a large portion of customers stay with a manager, this generates fees for years to come. Since asset prices tend to rise over time, asset managers who earn a fixed fee based on amount of money they manage are destined to earn more as well. This would not be a smooth ride up, but nevertheless the rising tide is destined to lift all boats up. Even if stock markets end going up by 6 - 7% in price annually for the next 2 - 3 decades, those asset managers are going to earn 6-7% more per year merely because they manage those assets. As long as the amount redeemed equal amount of new money invested, the asset manager will earn more money for shareholders simply for being there. It is a pretty sweet model after all, where if you come up with a mutual fund idea and raise hundreds of millions from investors, you get to earn an annuity like income stream, as long as asset levels are at least maintained. There is no risk for the manager, and the risk is borne by investors in the funds. Of course, if those asset managers also find ways to market their products and receive more in inflows from investors, their earnings per share could grow much faster than overall profits from other US sectors. The main problem behind mutual fund companies and asset managers is the rise in passive investing approaches, which have been popularized by Vanguard. It is tough to compete against an organization which runs its passively managed funds at cost, thus minimizing expenses for shareholders in those funds. However, I do believe that not all assets will end up in index funds, although the competition will much tougher than before. Even the passively managed index funds are not a panacea for the ordinary mom and pop investor, who needs some guidance for managing their retirement money. From my personal experience , ordinary investors tend to focus on their jobs and lives, and are not very focused on investing decisions. This is why it is quite possible that traditional asset managers who manage to reach to those individuals, and sell relevant investment products that generate recurring revenues to them, will benefit. It is very easy to buy and sell an investment these days, which makes "asset stickiness" a potential problem. In the case of Franklin Resources, assets under management have been in a decline for several years. This has pressured revenues and profits down. Other assets managers such as T.Rowe Price and Eaton Vance have managed to grow assets under management in recent years. Earnings per share have been aided by share buybacks. I do not like the fact that this asset manager is losing assets under management during a bull market. How bad would things get when we get a bear market? Of course, the tide could always turn. New products can increase revenues, plus strategic acquisitions could also boost assets under management, and then profits. The risk with acquisitions is that a very high price is paid out of desperation to get some growth, which could turn out to be a poor decision in the long run. Given the high level of assets under management, I wonder if Franklin Resources can become an acquisition target itself. It is obvious that the mutual fund business is not in the same position as the one enjoyed in the past 30 - 40 years. However, these businesses still generate fat profit margins and a lot of excess cashflows, which can enrich shareholders for a long time. I am actually more bullish on investment advisers such as Ameriprise Financial (AMP) than mutual fund companies such as Franklin Resources . However, many individuals who buy an investment such as a mutual fund, tend to hold on to that investment for years. In addition, fewer individuals have company pensions, which means that they would have to manage their own money, or otherwise risk not retiring. This is why professionally managed money will still be around, and earn fees for decades to come. The annual dividend payment has increased by 13.90% per year over the past decade, which is higher than the growth in EPS. I expect dividends to grow in the low single digits over the next decade. While Frankln Resources has a low dividend payout, and a low dividend yield, it has managed to distribute special dividend payments to shareholders on several occasions over the past decade as well. A 14% growth in distributions translates into the dividend payment doubling every five years on average. 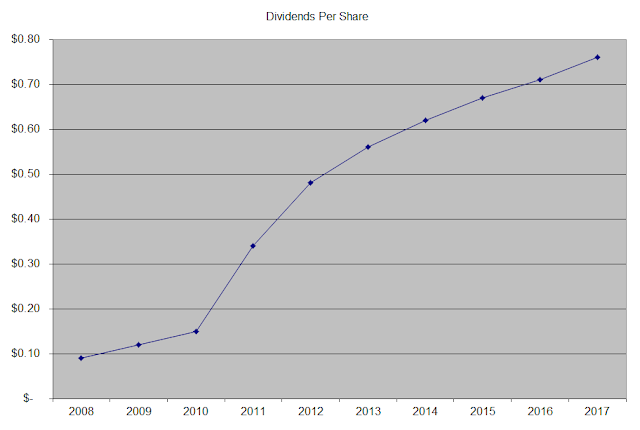 If we check the dividend history, going as far back as 1992, we could see that Franklin Resources has managed to double dividends almost every five years on average. 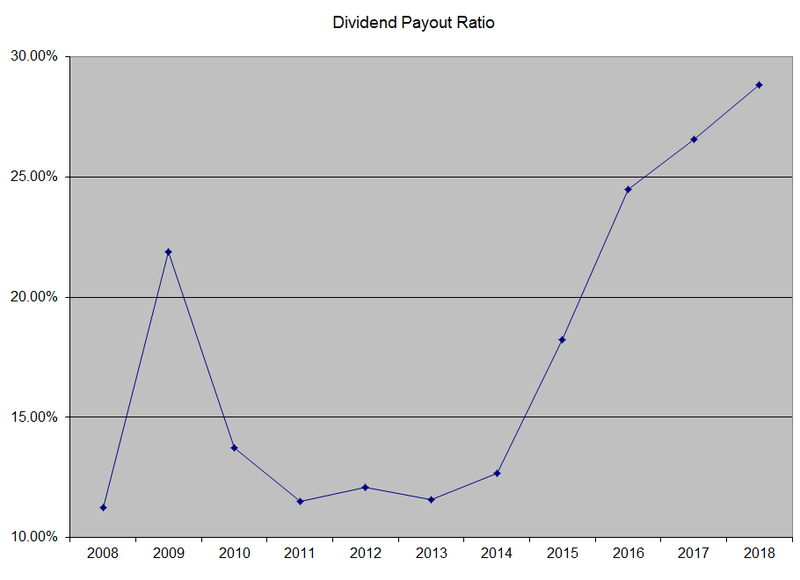 In the past decade, the dividend payout ratio has increased from 11.30% in 2008 to 28.80% in 2018. The company has done a combination of special dividends, share buybacks and dividend increases. If the underlying business keeps contracting however, there will be a limit to future dividend growth. A lower payout is always a plus, since it leaves room for consistent dividend growth minimizing the impact of short-term fluctuations in earnings. Currently, Franklin Resources is selling for times 10.80 times forward earnings and yields 3%. The stock seems cheap, and has a very good safe dividend for now. What worries me as a long-term investor is the fact that assets under management have been declining over the past four years, amidst a strong bull market. This has brought revenues and net income down. While I appreciate the special dividends and share buybacks at low valuations, I am hesitant to invest in a business whose fundamentals are declining. If management turns the business around, investors today will be handsomely rewarded by the dividends, special dividends and share buybacks, while the valuation multiple will likely expand too. A prolonged bear market could be crippling to a company whose customers are withdrawing their investments and the value of those investments goes down due to stock price declines. - Should I have a minimum yield requirement?